What I find fascinating is that these two approaches also manifest themselves in mathematics. There are constructive proofs that resemble the work of an engineer; and there are proofs of existence, that resemble the work of a philosopher. An entity may be defined by showing how to construct it, or it might be defined by its universal property — by being the most general or the most specific among its peers. A universal description is favored by category theorists, especially if it reduces their dependency on Set Theory. It’s not that category theorists hate set theory, but they definitely like to limit their reliance on it. In this post I’ll show you the two ways of defining a free monoid. If the term monoid is not familiar to you, don’t despair; it’s a very simple construct, and you’ve seen it and used it many times. The classic example of a monoid is the set of strings with string concatenation. Another is the set of natural numbers with addition (or multiplication — either will work). There are many examples of monoids, but there is a special class of them called free monoids. The easiest way to understand what a free monoid is, is to construct one. Just pick a set, any set, and call it the set of generators. Then define multiplication in the laziest, dumbest possible way. First, add one more element to the set and call it a unit. Define multiplication by unit to always return the other multiplicand. Then, for every pair of generators create a new element and call it their product. Define products of products the same way — every time you need to multiply two existing elements, create a new one, call it their product, and add it to the growing set. The only tricky part is to make sure that thusly defined product is associative. So for every triple of elements, a, b, and c, you have to identify a * (b * c) with (a * b) * c.
Here’s a little mnemonic trick that may help you keeping track of associativity. Assign letters of the alphabet to your generators. Say, you have less than 26 generators and you call them a, b, c, etc. Reserve letter z for your unit element. When asked for the product of, say, a and t, call it at. The product of c and at will be cat, and so on. This way, you’ll automatically call the product of ca with t, cat, as you should. As you can see a free monoid generated by an alphabet is equivalent to the set of strings, with product defined as string concatenation. What happens when your original set has just one element, say a? The free monoid based on this set would contain the unit z and all the powers of a of the form aaa.... Writing long strings of as is boring, so instead let’s just length-encode them: a as 1, aa as 2, and so on. It’s natural to assign zero to z. We have just reinvented natural numbers with “product” being the addition. Lists are free monoids too. Take any finite or infinite set and create ordered lists of its elements. Your unit element is the empty list, and “multiplication” is the concatenation of lists. Strings are just a special type of lists based on a finite set of generators. But you can have lists of integers, 3-D points, or even lists of lists. Not all monoids are free, though. Take for instance addition modulo 4. You start with four elements: 0, 1, 2, and 3. But the sum of 2 and 3 is 1 (5 mod 4). Were it a free monoid, 2+3 would be a totally new element, but here we identified it with the existing element 1. The question is, can we obtain any monoid by identifying some elements of the corresponding free monoid? The modulo 4 monoid, for instance, could be obtained by identifying all natural numbers that have the same remainder when divided by 4. The answer is yes, and it’s an example of a very important notion in category theory called universality. A free monoid is universal. Here’s what it means: I have a set of generators and a free monoid built from it. Give me any monoid and select any elements in it to correspond to the generators of my free monoid. I can show you a unique mapping m of my free monoid to your monoid that not only maps my generators to your selected elements, but also preserves multiplication. In other words, if a * b = c in my monoid, then m(a) * m(b) = m(c) in your monoid. Notice that the mapping might not cover the whole target monoid. It might cover a sub-monoid. But within that sub-monoid, for each element in my monoid there will be a corresponding element in yours. In general, multiple elements in my monoid may be mapped to a single element in yours. This way your monoid has the same structure as mine, except that some elements have been identified. Any monoid can be obtained from a free monoid by identifying some elements. You might find the above theorem in a category theory text (see, for instance, Saunders Mac Lane, Categories for the Working Mathematician, Corollary 2 on p. 50) and not recognize it. That’s because category theoreticians don’t like treating monoids as sets of elements. They prefer to see a monoid as a shapeless object whose properties are encoded in morphisms — arrows from a monoid to itself. How do we reconcile these two views of monoids? On the one hand you have a set of elements with multiplication, on the other hand a monolithic blob with arrows. Here’s one way: Consider what happens when you pick one element of a monoid and apply it to all elements — say, by left multiplication. You get a function acting on this set (in Haskell we call this function an operator section). That’s your morphism. Notice that you can compose such morphisms just like you compose functions: left multiplication by “a” composed with left multiplication by “b” is the same function as left multiplication by “a * b”. The set of these morphisms/functions — one for each element — together with the usual function composition — tells you everything about the monoid. It gives you the categorical description of it: A monoid is a category with a single object (“mono” means one, single) and a bunch of morphisms acting on it. There is also a bigger Category of Monoids, where monoids are the objects and morphisms map monoids into monoids preserving their structure (they map products into products). Some of these monoids are free, others are not. We know how to construct a free monoid starting from a set of generators, but how can we tell which of the abstract blobs with morphisms is free and which isn’t? And how do we even begin talking about generators if we vowed not to view monoids as sets? We have to work our way back from abstract monoids to sets. But to do that we need a functor because we’re going between categories. Our source is the category of monoids, and our target is the category of sets, where objects are sets and morphisms are regular functions. Just a reminder: A functor is a mapping between categories. It maps objects into objects and morphisms into morphisms; but not willy-nilly — it has to preserve composition. So if one morphism is a composition of two others, it’s image under the functor must also be the composition of the two images. In our case we will be mapping the category of monoids into the category of sets. But once you mapped a monoid into a set (its, so called, underlying set), you have forgotten its structure. You have forgotten that some functions were “special” because they corresponded to the morphisms of the original monoid. All functions are now equal. This kind of functor that forgets structure is aptly called a forgetful functor. Our goal is to describe a free monoid corresponding to a set of generators X. X is just a regular set, nothing fancy, but we can’t look for it inside a monoid because a monoid is not a set any more. Fortunately we have our forgetful functor U, which maps monoids into sets. So instead of looking for generators inside monoids (which we can’t do), we’ll look for them inside those underlying sets. Given a monoid M, we just pick a function p: X -> U M. The image of X under p will serve as candidate generators. Now let’s take another monoid L and do the same thing. We map our generators into the set U L (the set obtained from L using the same forgetful functor U). Call this mapping h: X -> U L. Now, U is a functor, so it maps monoids to sets and monoid morphisms to functions. So if there is a morphism m from M to L, there is a corresponding function from U M to U L (we’ll call this function U m). This is just a function mapping the set that’s underlying one monoid into the set that’s underlying another monoid. 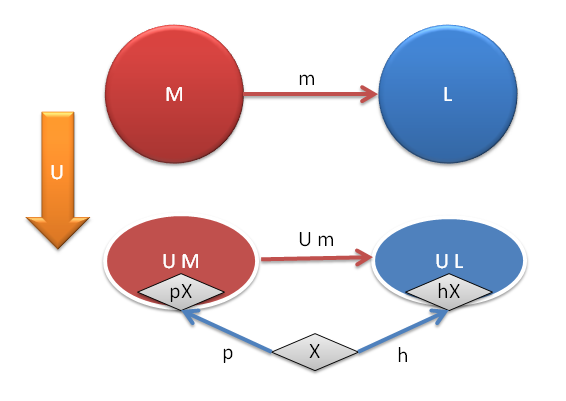 So given two monoids M and L and a set of generators X we can create candidate sets of generators in U M and U L. If we’re lucky, we can find a monoid morphism m that maps M to L and whose projection using U maps one candidate set of generators into the other. Now zoom out to the category of monoids and draw an arrow between any M and L whenever such m exists. What you’ll find out, to your great amazement, is that there is one unique monoid (up to an isomorphism) that has all arrows going out and none coming in. This universal monoid is the free monoid constructed from the set of generators X. The two completely different descriptions converge! How does it work? What’s the intuition behind it? A lot of mathematicians secretly (or not so secretly) subscribe to Plato’s philosophy. A monoid is a Platonic object that can’t be observed directly, but which can cast a shadow on the wall of the cave we live in. This shadow is the underlying set: the result of a forgetful functor. The morphisms between monoids preserve their nature; theirs shadows, though, are mere functions. Functions may be invertible, but often they conflate elements together. So if you have a flow of functions from one set to a bunch of others, they will tend to smooth out the differences, collapse multiple elements into one. So if there is one shadow of a monoid that dominates all others that are sharing the same generators — and there always is one — it must be the shadow of the free one. It is the one that has the largest selection of distinct elements, since every multiplication produces a new element (mitigated only by the requirements of associativity and the need for the unit). Free monoid is an example of a larger class of free objects. Free object is a powerful notion in category theory that generalizes the idea of a basis. Instead of the category of monoids let’s take any category that supports a faithful functor into the category of sets. A faithful functor is a functor that maps distinct morphism into distinct functions — it doesn’t mash them together. This will be our forgetful functor U. It maps an object A from our category to a set U A; and we can inject our basis X into this set, just like we did with generators. Object A is called universal if, for any other object B and any injection of X into U B, there is a unique morphism from A to B that “preserves” the basis. Again, by preserving the basis we mean that the image of our morphism under U maps one injected basis into the other. For me it looks like the relation between set and morphism you are referring to, are like space and dual space in linear algebra. Haskell nitpick: The monoid unit is mempty, not mzero. Instead of reserving z as the unit object, wouldn’t the empty string “” be a more intuitive and useful candidate? @Catherine Ray: The problem with this would be that we are not used to empty names. Imagine talking about this monoid on the phone. You have to give this element some name. But you’re right, I was hinting at the string monoid as a model for all free monoids. The empty string is the unit.